declared the Daily Mail on the morning of the Conservative’s election victory. I disagree. Unfortunately, the Tories’ meagre victory was more about a failure to rise up. The mass of disenfranchised, exploited, oppressed, intelligent, humane people, the whole badly served public failed once again to rise up. Neglecting to seize power for ourselves, we allowed the corrupt fill-your-own-elitist-pockets to triumph while the dreadful morality of Middle England droned and whined its nasal victory songs. 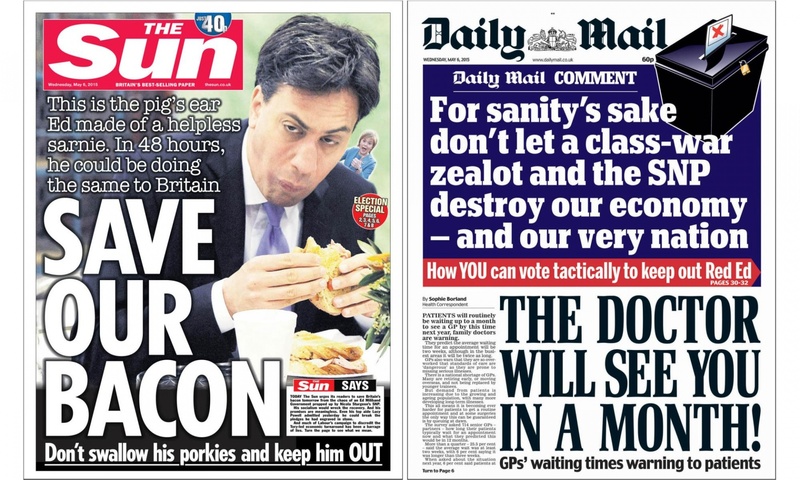 On the day of the election, The Sun drew out the bacon sandwich image just to make doubly sure that no one voted for this Jew-communist who can’t even eat pig-meat like a normal English bloke. But would his brother have been any different? Would the Tory-loving press have been any more kind to him? I doubt it. There’s always something to pick up on, always a way to spin the whole nation’s conversation away from policy and onto something personal, pointless and deeply damaging. 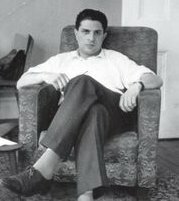 And remember David M (equally Jewish) is no one’s ideas of a saviour. 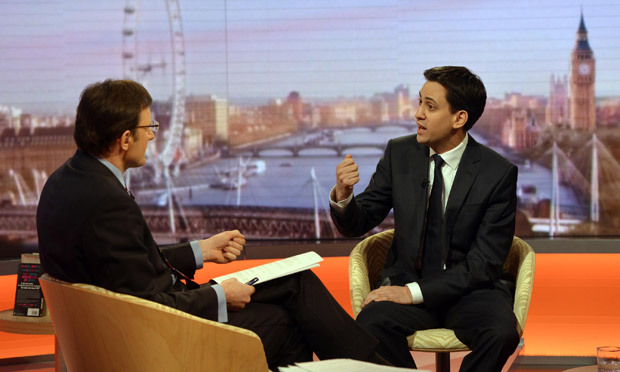 He was the Labour party hierarchy candidate of choice and from under their noses, the rank-and-file chose Ed instead. Why did he stand against his brother? I don’t know of course and maybe the whole thing is just an elaborate, illumanti-controlled farce, but my suspicion is that Ed feared his brother was going to betray their father’s ideals and somehow genuinely thought he could save the Labour party from its New Labour disaster. And the Unions and the ordinary members (there are still a few) thought he might do. Let’s look at a couple of things he said (rather than things he failed to eat properly). In 2011, about the financial crisis: “For me, predatory behaviour is when a business does something which is in its own short-term interests but does significant damage to the long-term health of the economy. … The state sets rules in relation to our benefit system, social housing and the way our economy works. It is not like there is an option of not having rules, it’s about what kind of rules they are … [the idea] that as long as people maximise their short-term interest, everything will be OK in business and elsewhere … It was wrong … it has caused problems for our society.” – This is actually an attack on neo-liberal politics. It is socialism dressed up in ‘ordinary people’ language. When he was (relatively) free to speak what he actually felt, we saw a person who was actually committed to social justice. It’s not a difficult title to win, but I actually think he would have been the best Prime Minister we have had in a long time. Yet it was not his ‘communism’ that was the problem. Labour lost because of a combination of their arrogance and cowardice. In Scotland, they did not support independence because it would deprive them of their parliamentary seats. Ironic of course because, by refusing to respect the democratic wishes of nearly half of the Scottish people during the referendum debates and then by going around telling everyone that they wouldn’t form a coalition with the SNP – a centre-left, natural ally, Labour lost all their seats anyway. If this was not a deliberate attempt to lose the election by Labour, it was, at best, bloody stupid. 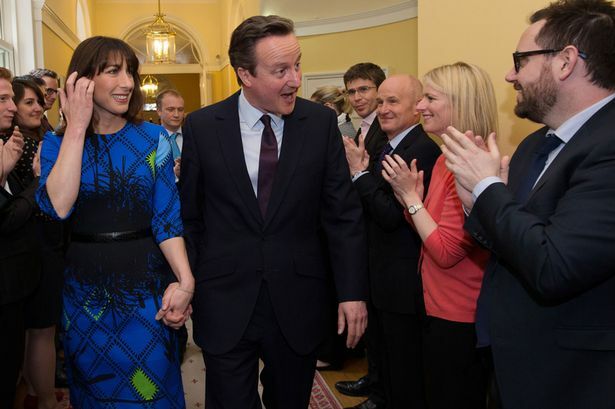 Their cowardice in the face of Tory and Tory-media attacks was laughable. Never had it been easier to be in opposition but they spent five years refusing to attack austerity in case they were told they were unrealistic economically. All the Tories had to do was to talk about their ‘long term economic plan’ (details not explained) and a load of nonsense about bringing down the deficit (they do not actually want to) and watch Labour self-destruct. Are the Scottish public so different from their English cousins? Do they really want something completely different. Britain is poor. Thirty of its thirty seven regions are poorer than the EU average because so much of its wealth is concentrated in London and the Home Counties. Labour’s strongest showing was in London where there are job prospects, money and opportunity. Across the boarded up high streets of the rest of the country, they failed to make much impact. They are (another) party of the rich. The point is that there was NO message of anti-austerity for voters south of the border. Ed was chosen as an outsider candidate because he might take us away from New Labour neo-liberal hegemony. The SNP swept the board in Scotland because they said they would divert some money (and land) from the wealthy to the rest of the country. It is a simple message and obviously popular. Labour being so concerned with what The Mail, The Sun, ITV and the rest of them said about them, failed to be boldly what they should be. It’s the same old story, same of Obama who surprised Hilary Clinton with a grassroots campaign, promising ‘change’ and then was restrained from changing pretty much anything by the a priori of politics. 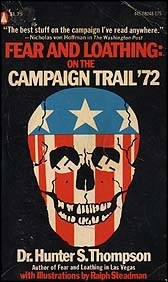 Same of George McGovern in his 1972 campaign against Nixon: surprisingly winning the primaries and then abandoning the very radicalism that won him the nomination (famously documented by Hunter S Thompson). The public want policies that benefit the public (call it ‘socialism’ if you want) and finance, the media and ‘the market’ make sure that no party dares to stand by them. The argument that New Labour were popular therefore we should bring back New Labour misses the historical moment. Tony Blair won in 1997 because ANYONE could have won as head of the Labour party against a Tory party that were dead in the water, riven by scandal after scandal and widespread fatigue with a party that had been in power for nearly twenty years. 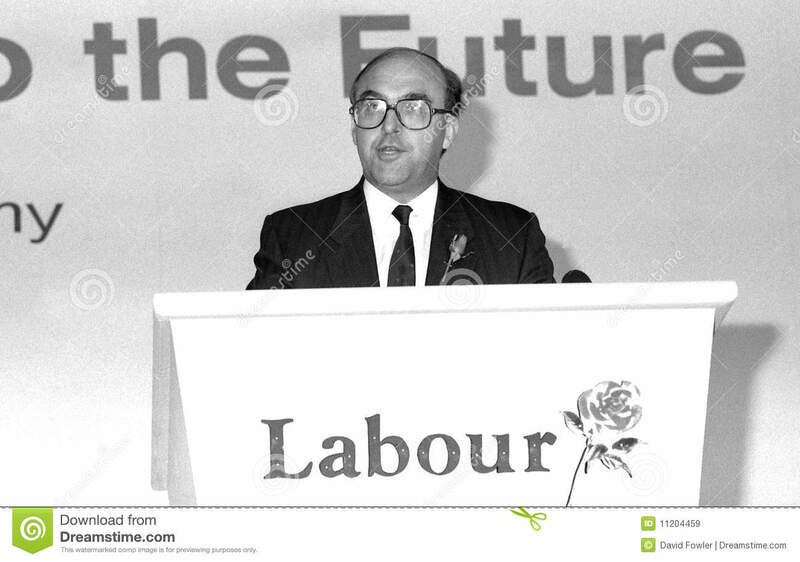 John Smith, had he not died, would have won that election as well. Blair became, let it be remembered, so unpopular that the party had to remove him in order to have any chance of winning in 2010 (of course by then, they were dead in the water, riven by scandal and widespread fatigue with a party etc etc). What Blair did was strip any remaining integrity from Labour politics, bringing in war, surveillance, a new racism, ASBOs, ‘hoodies’, immigrant detention centres, secret trials, imprisonment without trial, military torture, academies, further privatisation, university tuition fees, and his party continued the growth of inequality in Britain in a way that only a Labour government could have got away with. And, yeah, he built a few Sure Start centres and pretended to ban hunting. The lessons are there and will not be learned. In the self-confirming echo chamber of social media people seem excited that ‘now the Tories have won, we will start a genuine protest movement because we know the government are the enemy.’ I hope this is true. I remember the anti-austerity movement of 2010. What happened to it? Within a few years, without a political party or mainstream voice even close to its aims, it petered out. We need a voice in Parliament, not because parliament is the be all and end all of politics but because it is a place of power. The Labour Party will not provide it. Join the Greens. You might as well.